Depending on the ages of the children, they will be entertained by different things. Rather than a “one size fits all” show, I have different shows for different ages. Smaller children love something fast-paced and silly, older children want to be caught-out when they can’t guess how a trick is done and teenagers and adults enjoy seeing something they understand is impossible. With a birthday I guarantee that the birthday child (or children) will be the stars of the show and receive wands & certificates to keep, and all of the guests are given a free magic trick to take home with them. The children will be astonished and amazed, the adults will be baffled by my modern magic show that is suitable for all the family, packed with fun and entertainment. Everyone will know there’s a magic show coming when they see a traditional magician in bow-tie and top hat -and because I’m a member of the world famous Magic Circle you know that I’m going to perform top quality magic. I have performed in church halls, restaurants, theatres, community centres and living rooms – whatever the space you have, I can fill it with magic! 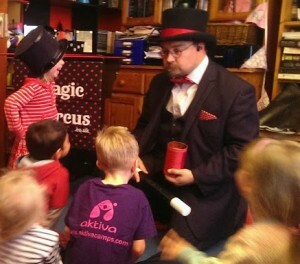 “Magic Marcus has just done the most astonishing magical trick on 25+ of my 5 year old daughter’s friends. 60mins of rapt attention punctuated by delighted squeals. Don’t know what your secret is but bottle it, Marcus, make millions. Meanwhile, to other parents reading this, can’t recommend him highly enough.” – Sophie, Hackney. For older children I can offer a full party package for a two-hour party. This includes a magic show, puppets, party games, invitations and music. I supply all the prizes, all you have left to do is arrange snacks and drinks. When the guests arrive we start with games, break for snacks or food in the middle and then have the magic show. This means that any latecomers can be easily included and you can sit back and enjoy watching your kids jumping about and having fun! Plenty of time to take pictures. After food the magic show starts, which means the tables are free to be cleared while all the family’s guests can watch the show. This cuts down on the after-party clean-up. “Just thinking about filling my house with unfamiliar five and six year olds filled me with terror… But Magic Marcus kept them thoroughly happy for 2 hours, and all I had to do was provide food. My son even said afterwards how much fun he had with no prompting. Definitely a huge thumbs-up!” – Elizabeth, Ealing. 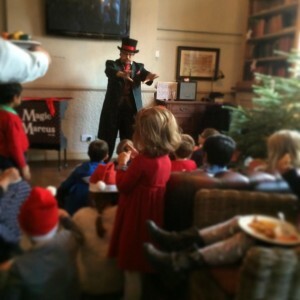 The Full Party Package is two hours, including the Magic Show. The Magic Shows are complete one hour magic shows. With all of these I can adjust the show to meet your requirements or party theme – click here for a no-obligation chat about how I can make your party magical!